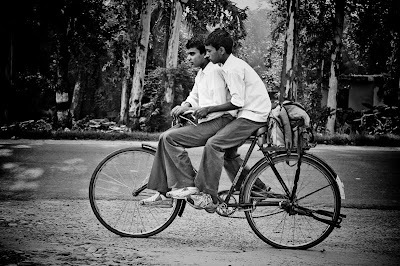 Photo: Two boys double-riding to school. Lahore, Pakistan 2009. Photo: Yes, that there is me going for the kill as I fight my way through Camp Rondo with producer extraordinaire and college roommate Steven Bray. I hope everyone had a wonderful Christmas. I've been enjoying my time with family and friends--and as I'm going through all the photo's from my personal point and shoot camera, this one stood out most. You see, Steve and I were college roommates--so when we get together during our annual camping trips, we go all out! And yes, that means having foam sword fights like three year olds. It's a good way to attract the "ladies." Gotta love foam. To see more of my behind the scenes photo's and candid snapshots, feel free to add me to your facebook. Hope all is well. I just wanted to put up a brief post to see how everyone is doing. Cheers to you and your family. Nine days to next departure. 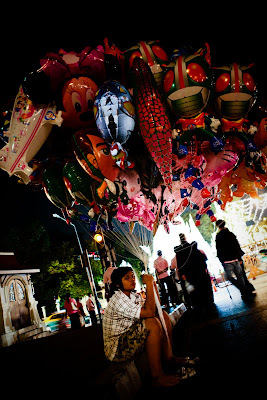 Photo: A night time salesman selling what he tells me are "Christmas Balloons" in Ho-Chi-Minh City, Vietnam. It's 3AM, and on the eve of Christmas, I'm awake--twisting and turning, slowly adjusting to time zones of days past. Arriving home a mere 72 hours earlier, my mind slowly grinds to a halt--no longer fueled by fear, aided by adrenaline. I'm at ease today. For the first time in almost six weeks, I'm not under pressure to perform, I can be myself, find an equilibrium, breathe, and for some reason, the world just seems perfect right now. I've yet to start Christmas shopping--nor have I thought of what to get for whom or where to go to get exactly what. And that's just fine by me. I feel great. I'm happy to be home--to sleep on my bed again, to feel winter's breeze against my face. I stopped to get fuel earlier today at a nearby station--and as I stood there admiring a set of ornamental lights glistening before me, a realization came to mind. A smile whisked across my face. And so this is Christmas--I thought to myself. Audible sounds of bells danced in the distance. Driving off, I continued to ponder the realities of my world--where I'd been and who I've become. An entire year had come and gone, and like a soldier marching to the beat of a wooden drum, I've returned home. Simple and surreal, after traveling, home is where I'd longed to be--which at this very moment, nothing else really matters. ...and so this is Christmas--and I'm home. Merry Christmas, everyone! I hope the festive season brings joy and happiness to you and your family--and remember: Faith is what makes all things possible, Hope makes all things work, and Love is what makes all things beautiful. Cheers to you and yours! 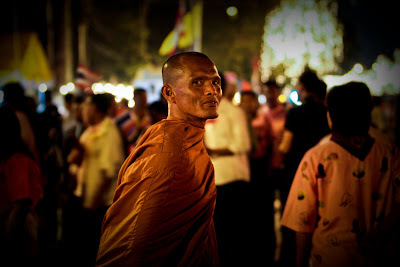 Photo: A Buddhist monk takes in the sights and sounds of the annual Kings Birthday celebrations in Bangkok, Thailand. I always love taking pictures of monks--and I don't know why. The way they look with their bald heads make them mysterious yet intriguing. Their wardrobe is simple yet intricate in its own way. Here's a shot of a monk enjoying the festivities in Thailand last week. I'm currently running around between Vietnam and Thailand trying to film the final story of my six week assignment in South East Asia. Will write in detail soon. Hope all is well. Sorry for the lack of writing as of late. 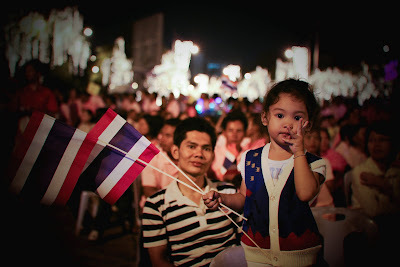 Photo: A little girl proudly waves her Thai flags at the King's birthday celebration, December 10, 2009. I had a very long day today filming in rural villages along the Mekong Delta region of Vietnam. Will write more about my journey in Vietnam in a later post. I'll leave you with a snapshot of a little girl in Thailand trying to give me the peace sign. This was taken last week at the annual Father's Day Celebration in Thailand to commemorate the King's birthday--recognized by many Thai's as the father of the land. Have a nice day, everyone! Peace! 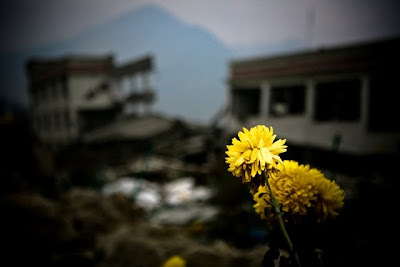 Photo: Flowers mark the site of a school demolished by the earthquake in Sichuan Province, China. It was just after 7am when I awoke in our vehicle. Looking out the window, it was as if I had died and gone to hell. Buildings were torn, ripped apart, left to slowly crumble in the aftermath of natures fury. It's truly surreal to see such destruction with your very own eyes--naked to the truth, privy to nothing. Acknowledging my arrival at the epicenter of the quake, my heart began to pound, my palms sweaty, my camera turned on--finger ready at the trigger. I was excited,anxious,proud to be one of the few foreign photogs allowed access to this area. My translator and I had worked effortlessly through the night--weaving our way through back channels of communication,trying desperately to convince our Chinese officials to let us into the restricted zone. After a few rounds of rice wine, phone calls and hand shakes, we finally received the go-ahead. Stepping out of the vehicle, I ran for my tripod, quickly dropped its legs to the ground and mounted my camera. It didn't matter to me where I was, what I was doing or who was looking. All I wanted was to capture the destruction, the turmoil, the loss and devastation of a country that neither clung to my heart nor mattered much to my psyche. This is China--and for all I cared, what I was filming was epic news, heart wrenching, television at its best. Journalists from all over the world yearn for this moment, they dream of this chance--and here I am, deep in the midst of tragedy, soaking in the rays of light that entered my lens. I'm lucky, I know. I zoomed in and out, close ups and wides. No matter where I pointed my camera, a kaleidoscope of shapes and patterns formed images of loss--of pain and displeasure--ultimately feeding my appetite with what I had longed to taste. Broken chairs littered the ground. A single shoe, a child's hat. Calendars hung from wall to wall, slanted--stopped in time, motionless in space. A cloud of white dust glistened my shoes as I walked about--scanning my surrounding like a vulture waiting for the dead. Looking up, I noticed a chalk-board stood half broken. Zooming into it, I pulled-focused on a line of scribbles that resembled a child's hand writing. Small finger prints littered an empty black surface. Putting my camera down, I viewed the room for the first time with my own bare eyes. A haze of white smoke danced in the light as I stood still. And within a synapse of a moment, my world had stopped spinning. Motionless. Barely able to breathe. Barely able to come to terms with myself as I realized where I was standing. Putting my head down, a teddy bear on a child's lunch box stared back at me. My stomach churned. My throat caught in rapture. I walked out of that school room with out taking another shot. I've been in this type of situation before--when I use my camera a shield of honor, of valor and faith, courage and distinction--only to find myself caught in my own array of guilt and shame. Sometimes, when caught in the moment, I lose sight of who I am, the morals instilled within me and the respect for human life I've learned to value. I guess, after working so hard to gain access to this area, I had forgotten the true purpose for why I perform the task that I'm given. By the time I had made it back to the meeting point, my translator was already waiting for me in the car. Her eyes were stained in tears. Running her hands across her face, she tells me that over 200 school children were buried at this site. Alive. Looking around, I noticed I had drawn a crowd. Local elders, parents and children were there to greet me. Some shook my hand, not knowing exactly why. But as I locked eyes with them, I saw their pain. It's an image I can never forgive myself to capture, nor will I ever try to. I spent the rest of my time shooting from afar, creatively finding other angles to tell this story. I didn't want it to look like a piece you'd watch on CNN or some low budget TV station glamorizing the loss of human life. It's the least I could do. I didn't sleep that night. I tried to keep myself busy by spending hours returning emails back to HQ, writing scripts or Christmas shopping online. Some how, I felt the need to humanize myself again, replenish my soul, apologize for what I'd done. I didn't want to close my eyes--for I feared what dreams may come. Blogger Note: I apologize for my lack of posts lately. Frankly, I didn't know how I was going to write this story. As always, I'd love to hear from you. Currently safe in Bangkok, Thailand. I'm currently 2 hours outside of Chengdu City, about a 3 hour flight east of Shanghai. I'm on my way to the area in Sichuan province where the earthquake last year had hit hardest. But as I'm finding out this morning, my translator and I are running into one political roadblock after another. Every district we enter, we are asked to step into a government office to be questioned, meet the local officials and basically, be interogated. I'm asked the same questions over and over again: where are you from? Who do you work for? Why are you here? What kind of camera? Would you like some tea? At first, it was kind of scary. The government buildings look like old-runned down schools or hospitals, the doors are stained with dirt--as if it hadn't been washed in years. And upon entering each room, I'm greeted by a uniformed officer dressed from head to toe in official military garmet--some sporting a rainbow of medals on his chest. But, as the conversations went on, they seem to open up, and as human as they are too, they laugh, smile, and even offer me tea. Hmmm, maybe communism is letting up a bit. I'm trying to gain access to film in a town called Betrund (excuse my spelling). It is currently blocked off to all foreign media, but I'm going to try my luck today. I have a good fixer working with me, and she seems to be good at mingling with local officials. If we gain access, I will spend the night in the village and try to capture as much as possible. Its freezing here, colder than Shanghai. Luckly I was able to find a jacket when I was in Shanghai a few days ago (previous post below). It says Columbia Sportswear on it, but I doubt it really is--as everything sold here seems to be a knock off. Lately, I've been in and out of China going back and fourth to Taiwan to work on multiple stories. But today, I'm focused solely on earthquake story. I'm tired. I'm exhausted. I haven't slept much the last two nights, and the realities of being on foreign assignment are starting to kick in. Its week #3 for me, with three more weeks to go. Its cold, I'm shivering as I'm typing this post on my Blackberry. Need to buy gloves. We currently have two government guids assigned to follow my every move. One guy is a tall skinny soldier, maybe the star basketball player on his platoons b-ball team. The other guy is short and chubby, maybe just along for the ride. I know the tall one can beat me to the ground if he wanted to. As for the short one, I can probably out run him. I will update again soon when I return to the city. Wish me luck. Hope this finds you well.